More years ago than I care to remember, I can recall learning about ancient Greek plays in school and being completely underwhelmed. For all the talk about how much they influenced the development of Western culture, they were far too alien for my tastes - especially the moaning/wailing chorus which always struck me as being ridiculous and absurd. Some things just don't translate very well from one culture to another. Unfortunately though I missed out on learning from many of the Classics because of this. 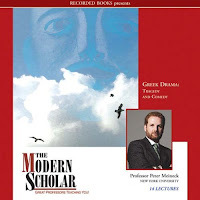 I came across this lecture by NYU Professor Peter Meineck which is part of The Modern Scholar series. I have to say that I am very impressed with Meineck's narration as he made the Greek plays he spoke about "come alive" to me in a way I've never experienced before. I actually wanted to read a few afterwards to see what inspired his obvious passion for them. All in all the time spent listening to this lecture on CD I believe was educational and well worth it. Even if you never cared much for most of the ancient Greek plays, as I did, I highly recommend getting this and giving it a try. You'll be glad that you did!